Exploring the coast of the Primorsky Territory on the Russia's Pacific Coast, with its uninhabited islands, secret bays and picturesque cliffs might remind you Stevenson’s and Sabatini’s novels and pirate films of the Caribbean. For travelers that have already visited Vladivostok’s embankments and have photographed its bridges, this could be a perfect jumping off point for getting to know the beautiful treasures of the surrounding areas more intimately. Vladivostok (population: 603,244) is far from Moscow (6,418 kilometers from Russia’s capital, but also just 7,580 kilometers from Seattle, U.S.) and was recently included by “National Geographic” on its list of the top 10 oceanfront cities, together with such gems as the Australian city of Brisbane and San Diego in the U.S. Thanks to its fortunate geographical position, Vladivostok and the surrounding area offers travelers much more than other cities in Russia’s Far East. Its continental hinterland is located in a taiga covered with lianas and populated by tigers, while its marine area contains wild islands and secret bays with sunken treasures. Тhe most famous among the local bays is the Golden Horn, on whose shore Vladivostok was founded in 1860 (the bay was named in honor of its counterpart in Istanbul). But it has other names: the Chinese call it “Haishenwei,” meaning “Gulf of the Trepang,” while the English, who paid a visit during the Crimean War in the 1850s, named it Port May. Today, instead of swashbuckling pirates, Primorye (a common name for the area) hosts poachers that illegally fish the trepang and bootleggers that smuggle Japanese whisky into Russia. Instead of the “honghuzi” (Chinese bandits that proliferated in the area in the late 19th and early 20th centuries) there are Chinese hairdressers, cooks and merchants. However, the coast still features some wild places where you can feel like an adventurer. Every spring ships set sail in all directions. Vitaly Yershov, a professional diver from the village of Rybak about 150 kilometers south of Vladivostok, has designed a sea depth map of the area near the coast. He has recovered many few artifacts from underwater dives: cartridge cases, bricks, cannons and cladding pieces. “This is not the Red Sea and not even the Black Sea. They didn’t carry gold and jewels here,” says Yershov about this area centered near the town of Slavyanka. Yet, underwater there is plenty to see. Near Cape Shultz the Lysva fishing boat sunk in 1972 under unclear circumstances. Near Cape Gamov is the steamship Vladimir, which sank following an accident in 1897, while next to Karamzin Island there is the Japanese destroyer Hibiki. French cannonballs dating back to the Crimean War (1853-1856) have been found here. One of the most beautiful bays in Primorye is Narva Bay (the natives called it Sidimi) located in the Khasansky District. In summer you can get there by a daily motorboat that connects Vladivostok with Slavyanka and stops at Bezverkhovo. In other seasons the best way to get there is by taxi. In Slavyanka there are several hotels not far from the pier including the Pallada Hotel, while the Teploe More Hotel is located a bit further back. In Bezverkhovo you can set up a tent on the shore and during high season locals often rent out their houses. 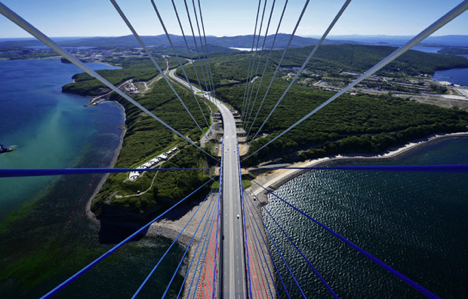 Russky Island, separated from Vladivostok’s center by a strait, remained wild until very recently when a bridge was built to connect it to the mainland for the APEC 2012 summit. The embankment on Russky Island’s Ajax Bay is a great place to take a walk, while the nearby Paris Bay hosts the biggest aquarium in Russia. However, nature is never far away: if you get off the only asphalt road of the island, you’ll end up on hills covered by taiga. In Soviet times the island was used by the military and closed to visitors. A few servicemen have remained to this day, as well as a unit of the Navy special forces. Be careful not to wander too far as part of the island is the territory of the Ministry of Defense. Watch out for signs. The shores of Novik Bay, Russky Island’s biggest bay, is popular with visitors. There are some hotels and camp areas including the Renaissance Hotel and the Novik Country Club. After building the bridge a regular ferry with Russky Island has ceased to exist and it can now be reached only by bus or taxi. There are many stories related to the bays and hills of Putyatin Island, located east of Vladivostok. Merchant Aleksey Startsev lived here at the end of the 19th century. He built a porcelain and brick factory and he also bred horses on the island. On Putyatin Island there is a small settlement and a picturesque lake with lotuses. Visitors here can set up their tents for the night and fish in the sea. All the fish here is edible, except for the poisonous fugu, a Japanese puckerfish (see a short English-language video on the fugu). Not far away is the wild Askold Island, which can be reached only by motorboat. Askold is formed in the shape of a horseshoe with the Naezdnik Bay in the center. Here in the 1860s Chinese workers mined gold illegally and clashed with Russian soldiers. The Manza War resulted (from ”Manzy,” a term used in Primorye at the time to describe the local Chinese) during which Chinese miners burned down several villages. Efforts were later made to find gold here, but by then the island had become a military outpost. Today only a lighthouse remains from that epoch. There is a ferry that goes there from the village of Dunay, which you can reach by bus from the town of Fokino. The town of Fokino is on the Vladivostok-Nakhodka highway about 130 kilometers east of Vladivostok. Fokino is a closed town because the Russian Pacific Fleet is based there. Foreigners must have a special permit to visit the town. However, the Islands of Putyatin and Askold, which are a part of the territory administered by the town, are open for visits by tourists.